A free flowering perennial bearing long spikes of brilliant blue flowers. Very attractive in masses and useful in borders. Blooms early in the summer. Wildflowers require little care. 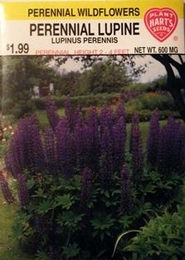 Lupine prefers cool weather and a sunny location. Water only when needed by soaking ground around plants. Thinning - when plants are 2-4 inches tall thin to 15-24 inches apart.